Students from Grace College, Winona Lake, Indiana; a high school tutor; and adult advisors yesterday began a six-week pilot program in an after-school class at Jefferson Elementary school in Winona Lake, Indiana, under the auspices of a newly-formed Grace Brethren cooperating organization, Grace In Action (GIA). 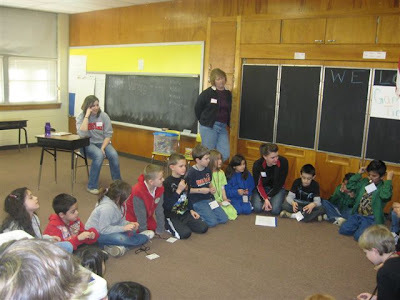 Twenty-two students eagerly participated as the first lesson from DISCOVERING Life Skills for Kids was taught. The total curriculum for children ages 5 through 8 has six units. The pilot program covers Unit One, “DISCOVERING How to Make Choices.” Other units teach Kids with Character, Love Matters, Personal Care, Dollars and Sense, and Personality and Potential. Two additional sections of lessons are being written: ACHIEVING Life Skills, for children 9 through 12, and LEADING Life Skills for Teens. The lessons are supplemented with many fun and relevant books, games, interactive computer helps, and personal coaching. The faith-based curriculum, written by Gladys Deloe of Winona Lake and the founder of Grace in Action, is being published as part of the ministry’s purpose, “Preparing children to become productive citizens.” The ultimate goal is to help children in poverty free themselves from the poverty cycle by presenting another way. As the church bridges to the community, educating and enabling in the name of Christ, some children will find the tools for living and a purpose for their lives. GiA has received two grants from a local county foundation and has recently been recognized as a cooperating ministry by the FGBC. For more information about using the curriculum, contact Gladys Deloe at gdeloe@comcast.net or 574-527-6160.